Home > Card, Paper & Vellum > Pearlised Card. We would like to introduce UK Card Crafts 6"x6" Double Sided Pearl White Card. This card is pristine white with oyster pearl coating on both sides. This card is 250gsm and very stiff. We have tested this card through 6 inkjet printers mainly Epson and brother and works perfectly although you do need to print on the best setting to make they image or text stand out due to the over powering pearl coating or to get technical increase the saturation of ink flow, which the best printing setting should achieve. We wouldn’t recommend putting pearl card or paper through any laser printer. 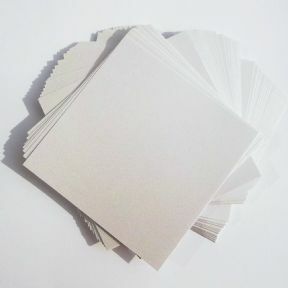 If you're interested in ordering a large trade quantity of this item (50 Sheets x 6x6 Pearl White Card Stock, Double Sided, 250gsm Stiff Board) then email us and we will send you a quote. Please note that this is not possible on some items. Please include the quantity and item(s) in your email. All quotes are sent via email. You can use the "contact us" form on this website for quotes.